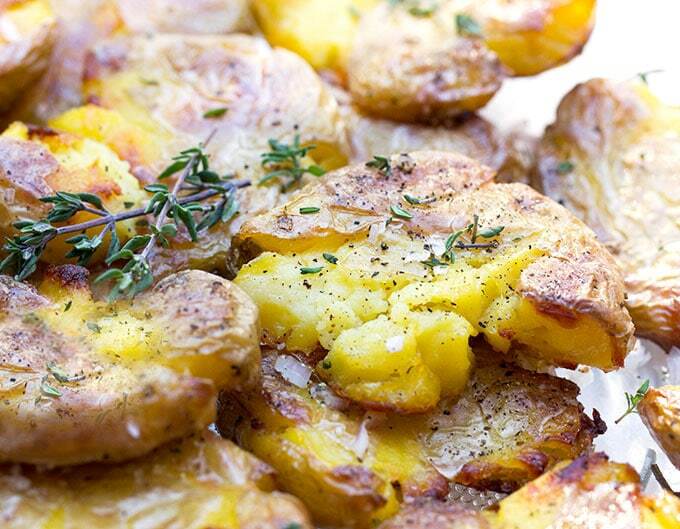 These smashed potatoes are so incredibly good. 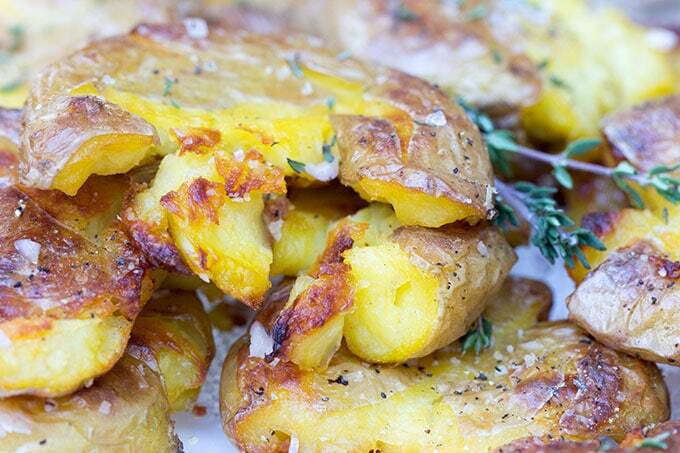 Crisp outside, tender inside, topped with olive oil and spices or anything else you can dream up. The recipe is easy: boil, smash, add toppings, and crisp in the oven. Great for company because you can boil and smash them ahead of time. 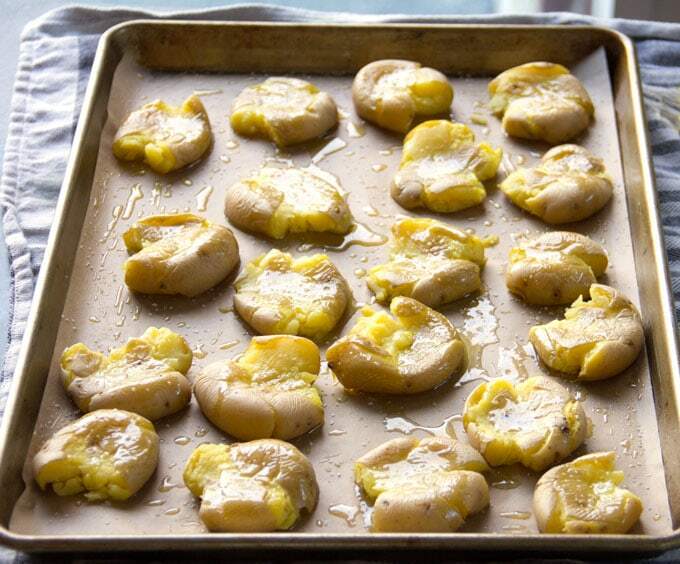 Top them and pop them in the oven right before dinner. The holidays are here! There’s no snow on the ground in Boston yet but Christmas lights are glittering around town and Hanukkah is in full swing. Many of us are braising briskets, frying latkes, giving presents and making plans for holiday entertaining. It’s all very exciting! 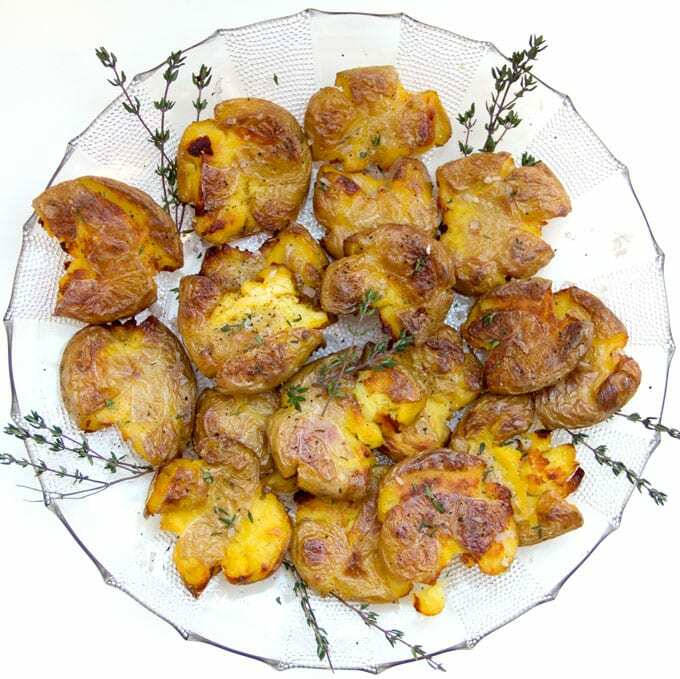 I wanted to be sure to tell you about crispy smashed potatoes in time for holiday menu planning because they’re extraordinary! They’ve got the gestalt of french fries – crisp on the outside and tender inside – but they’re not fried. This is a perfect recipe for entertaining because the technique is relatively easy and you can do a lot of it ahead of time. 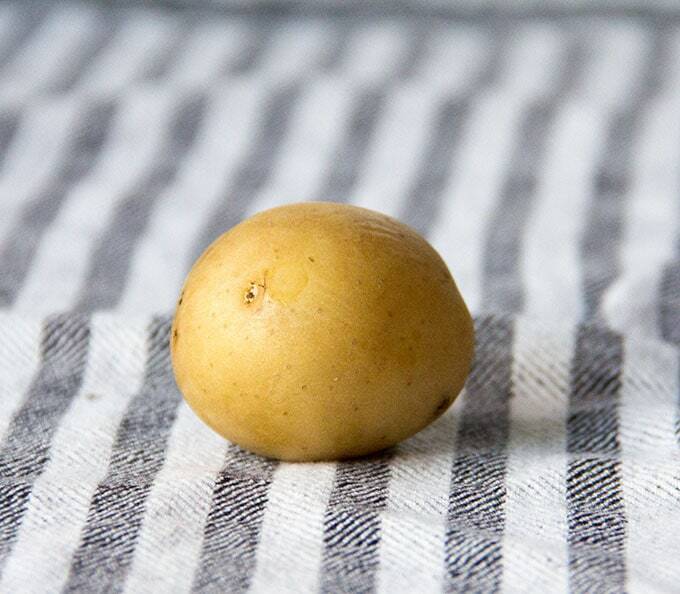 There are many smashed potato recipes around the web and in each case the essential method is the same: boil, smash, oil, salt and crisp in the oven. 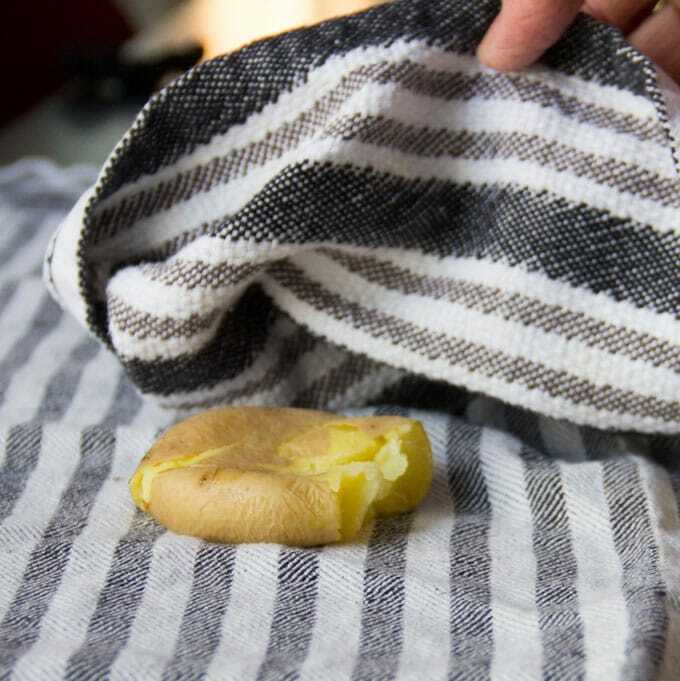 I really like the potato-smashing technique that Fine cooking came up with of putting the potatoes between two dish towels. It keeps them from rolling around the protects your hand from the heat. 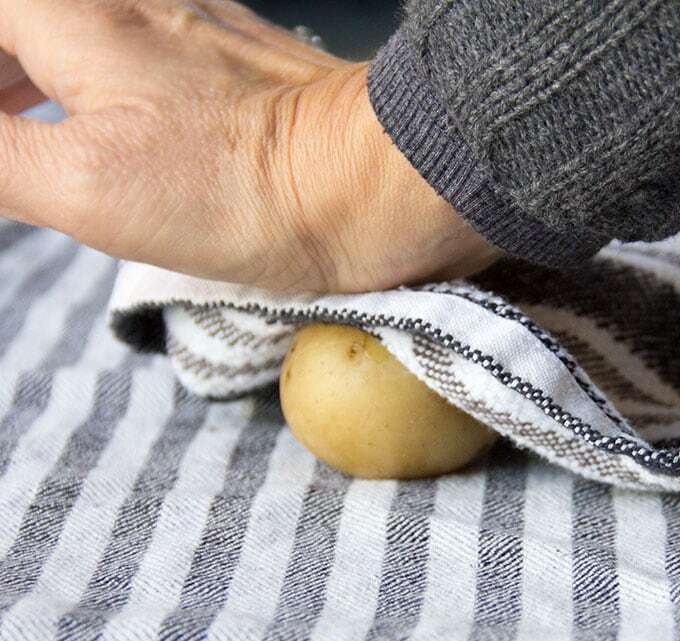 After the potatoes are boiled and drained, you lay them out on a clean dish towel while they’re still hot. Then you press each one with the heel of your hand, to flatten. Then you transfer them to a parchment-lined baking pan, oil and salt them, and roast them until they get nice and crisp and brown around the edges. If you’re cooking for a dinner party and want a stellar potato dish that has all the messy prep work done ahead, this is a great choice. You can boil and smash them ahead and lay them all out on the baking tray. 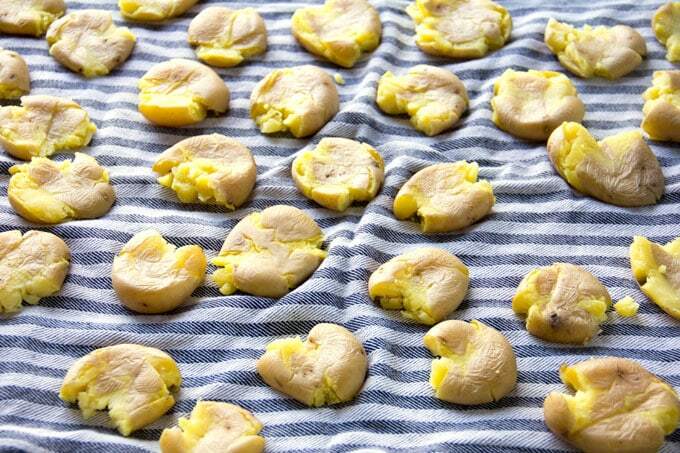 Keep them overnight in the fridge, covered with plastic wrap or foil. Then just oil, salt and roast right before your party. I’m definitely making these at least once during the holidays. If you decide to make them I hope you’ll come back and leave a review and let me know what you think! 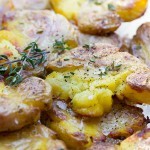 There are about a million food bloggers writing about how to make this style of potatoes. I remember trying one of those recipes a long time ago and being disappointed. These pictures looked so good and I trust panningtheglobe so I gave it another shot and it came out great. These look great! If I add some Parm and garlic should it go on before cooking versus after? I wouldn’t add chopped garlic before cooking because it might burn. I suggest you slice a couple of garlic cloves and sauté them in a good amount of olive oil to make garlicky olive oil. Remove the garlic pieces from the oil and toss or brush the potatoes with the garlicky oil and a little salt and pepper. Towards the end of cooking time sprinkle the potatoes with a mixture of olive oil, parmesan cheese and finely minced garlic (red pepper flakes and parsley would be nice in there too). Cook for a final 5 minutes or so, until the topping gets hot and starts to brown a bit. I hope you enjoy – let me know! I always add lemon juice and rosemary to them. I made these for a Christmas dinner party. They were gone in a flash! I have wanted to make these for SO long – and yet I’ve never looked up a recipe. thank you for sharing – these just might happen this week! I never met a potato I didn’t like but these definitely hit the spot. I love it when they have crispy edges and the inside is soft and fluffy. Have been looking for a perfect smashed potato recipe that doesn’t involve much work and boy is this ever it!! Printing out and will be making it a lot. THANKS! Glad you found what you were looking for Betsey! I hope you enjoy! !